All right. Let’s try something that might actually work, and doesn’t sound bawdy in the process. I went through my various Mail Pouch Barn shots, and pulled this one out of the archive. It’s a nice one from 2010. Mail Pouch Barn. Nikon D700 camera. Photo (c) Chuck Miller, all rights reserved. I must make some “edits,” shall we say. First off, this barn should only have one advertisement. 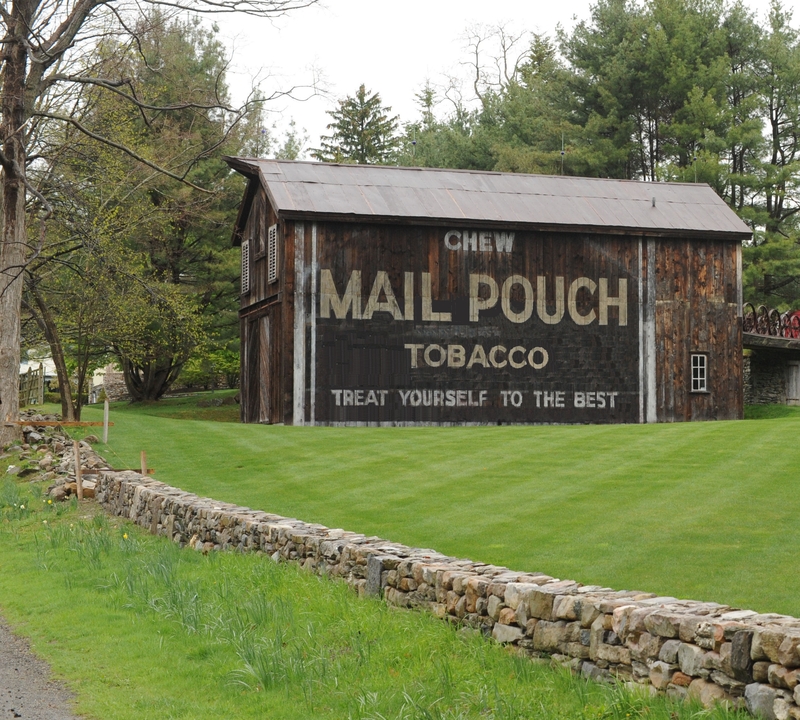 And that would be the iconic “MAIL POUCH TOBACCO” sign, along with the word “CHEW” at the top of the barn, and “TREAT YOURSELF TO THE BEST” at the barn bottom. So I digitally wiped away the second advertisement, the one about a transfer and shipping company from South Central Pennsylvania. Besides, if I focus this barn on just the Mail Pouch tobacco entity, then the piece becomes more rustic and less regional. I also removed a few splotches of eye-grabbing white from the stone fence, and cropped the picture slightly to remove the red carriage house at the top of the berm. And here’s what I created. Mail Pouch Barn, edited version. (c) Chuck Miller, all rights reserved. Ethically, I couldn’t enter this picture in a photo competition even if I wanted to. I’ve edited out too much of the original photo – including the old shipping advert that made up part of this barn’s aesthetic. Trust me, I’ve heard of images that get bounced from major photo competitions simply because someone digitally removed a leaf from their picture of a grassy knoll. Oh no, I’m not entering this picture in competition. I’m going to do something … shall we say … more fun. Have you ever worked with latched hook kits? You know … that plastic grid pattern and all those little snippets of yarn? Yeah, when you made a wall hanging or something, back when you were eleven years old? 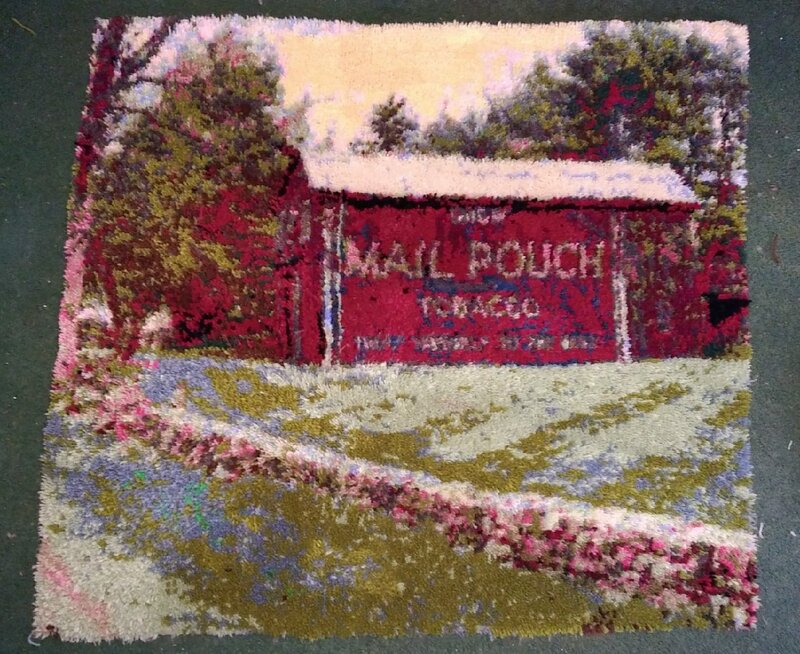 Well … I want to turn this picture of the Mail Pouch Barn into a waycool wall hanging tapestry. Look, I’ve tried everything else in my lifetime – Dream Windows, crate art upcycling, stitched burlap … why the hell not try a latched hook project? 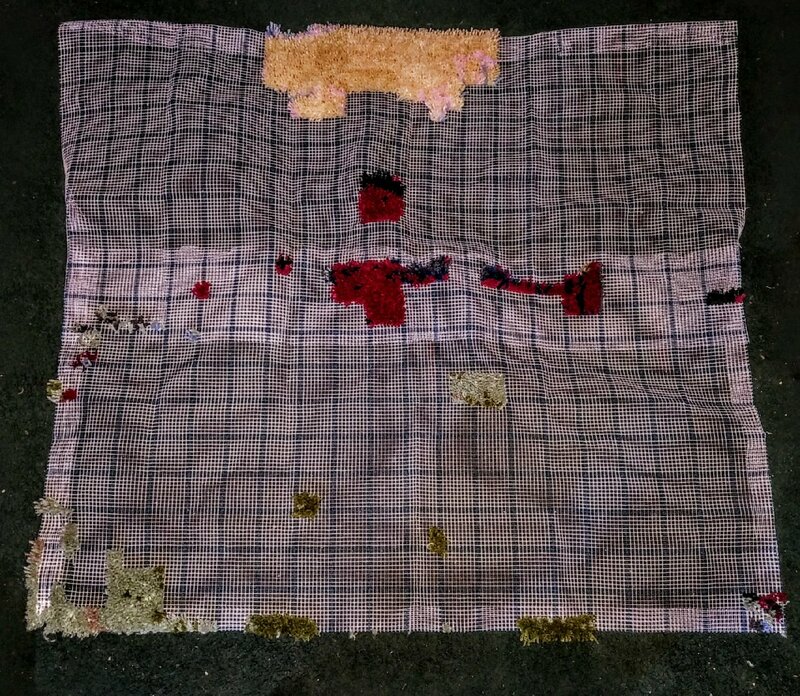 Thankfully, rather than try to hand-trace my original photo onto the plastic backing, I found an online program called Leftsource that allowed me to upload my Mail Pouch Barn photo, and it in turn would create a pattern that I could follow, grid by grid, stitch by stitch. Holy Simplicity designs, Batman! My photo – when blown up to a 36×40 design – would need 22 distinctly different colored batches of yarn, 36,000 individual strands in total. You heard me. Thirty six THOUSAND strands. This is not a rainy day project. This is a rainy COUPLE OF MONTHS project. Now comes accession. According to the pattern, I could buy the correct yarn, at 320 strands per bale, from an online craft company named Mary Maxim. No, seriously, let’s do this. I went to Mary Maxim’s website. First I need two batches of medium light blue rug yarn. What? Out of stock? What do you mean, out of stock?!? Let me try another color. Off-white. They should have plenty of off-white. A quick call to Mary Maxim’s website customer service department alerted me to the sad news. 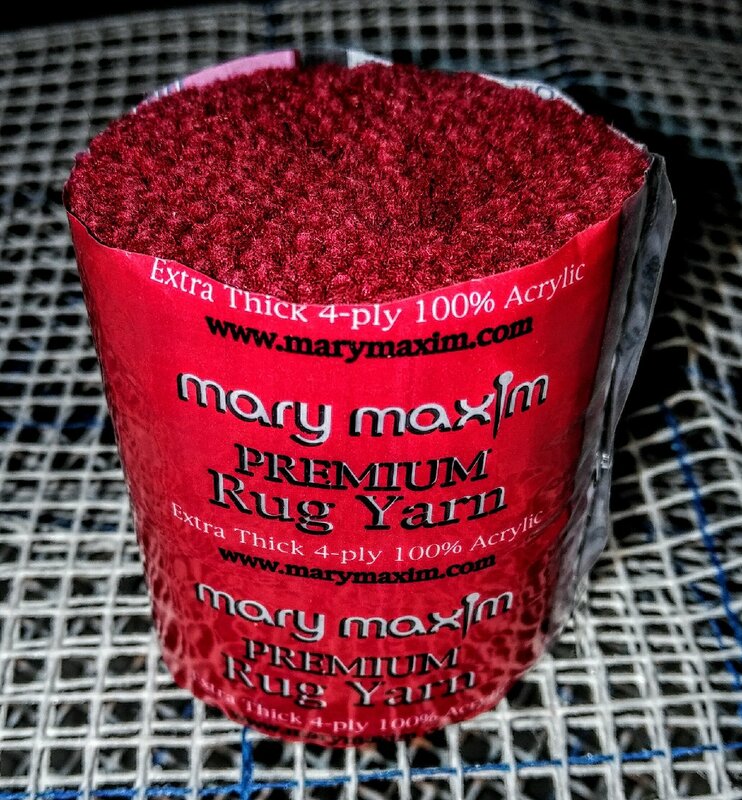 Mary Maxim is scaling back its latched hook rug yarn product, and not all colors were available – including that medium light blue shade I desired. And they didn’t have enough off-white in their sales department to completely fill my order. Nertz. If I want to do this … including acquiring all the yarn necessary for this project … I have to work fast. And I have to be CREATIVE. A quick scoot around the interwebs, and I found two other rug yarn dealers, Herrschners and Craft Critter, along with an Amazon link to a product called MCG Textiles. Okay. As long as I can get my colors from any one of these four different distributors, I’ll live. Each rug yarn bale contains 320 yarn strips. Thanks to the computer-generated inventory pattern, I discovered that I only need five strips of a color called Sand. However, for something called “Medium Avocado,” I need over 7,000 strips for a 36×40 wall hanging. Who the hell needs that much avocado in their life? You could feed a small village guacamole for a month and still not use that much avocado. In fact … remember my search for “off-white”? None of the distributors I sourced had that shade. 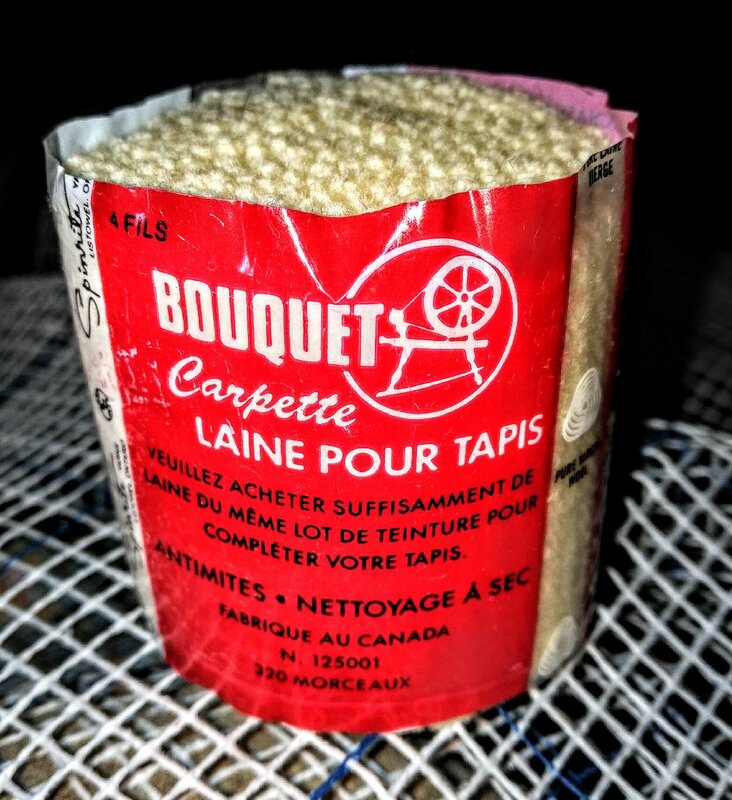 I had to snag eight batches of off-white from a Nova Scotia hobbyist, who in turn scored the strands from some company called Spinrite, who sold a Canadian rug yarn product called Bouquet. Three right turns to make a left, I guess. And I don’t want to hear a single peep from any purist out there who’s looking at my yarn supplies and grumbling that I’m mixing different brands and different compositions and such… wool yarn, polyester yarn, acrylic yarn, cotton yarn, yarn is yarn, I mean no harm. 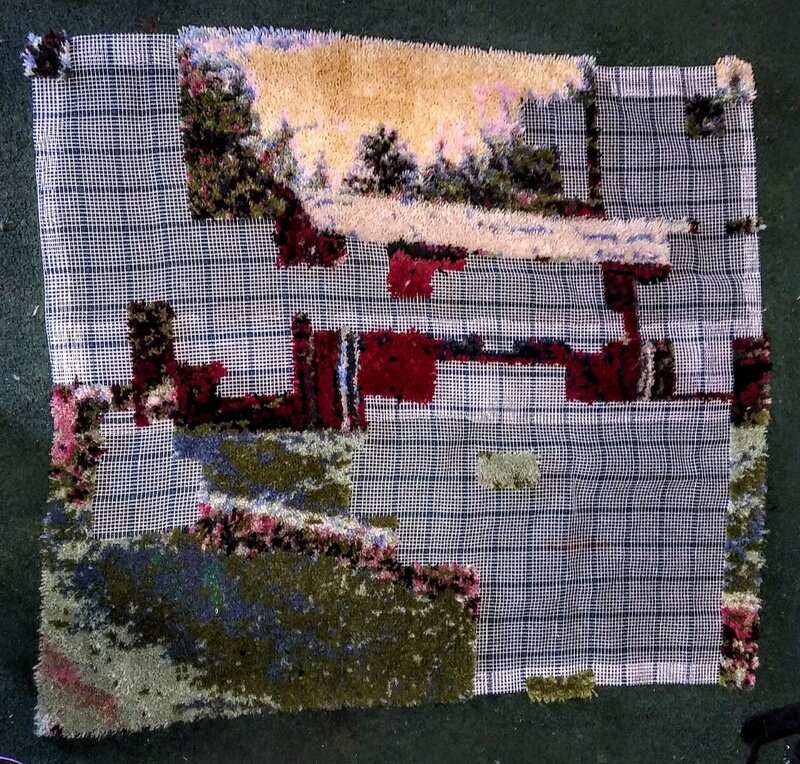 But if I do more than one of these latched rug projects, please feel free to come over to my house, hit me in the head with a frying pan, and tell me that I should know better. All right. I have the yarn and the canvas. Let’s start. One thing before I start. Yeah, it’s a false start, bear with me. 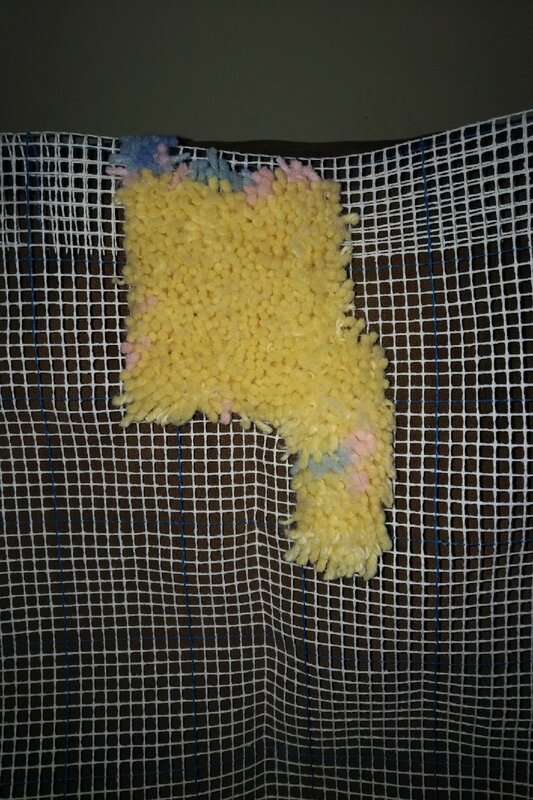 You need to start your latched hook project from the bottom and work your way up. 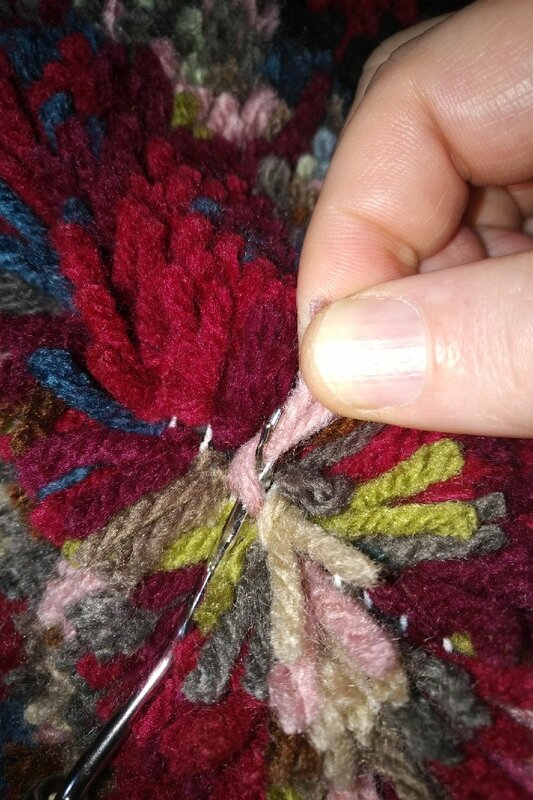 If you start at the top, you will inevitably accidentally hook your strands (which were already inserted into the base) and cause them to tangle and rip. So I started from the bottom. I could move up the grid so long as I had the proper color available and enough strands to make it work. Once there was a color I didn’t have strands for – I moved to another column and started from the bottom again. This is essentially one batch of “light willow” rug yarn. 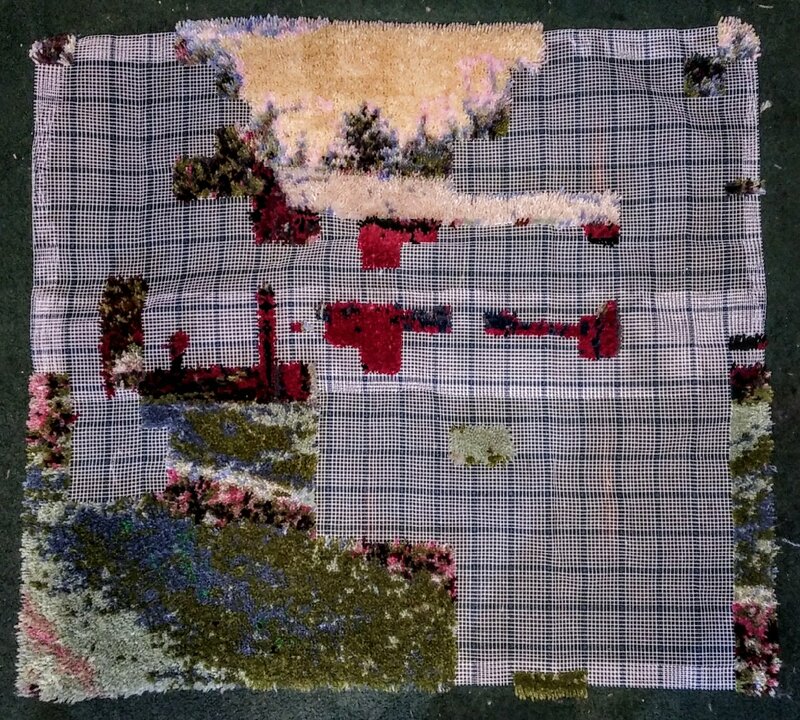 There are three hundred sixty 10×10 squares on this canvas, with a total of 36,000 rug yarn snippets. I would need to complete at least one 10×10 square per day to get this done within a year. In case I couldn’t get my rug yarn skeins from my online suppliers … I went to the local fabric stores, hoping I could find emergency rug yarn strands. Jo-Ann Fabrics – one of the attendants there looked at me as if I had grown three heads. Right. SURE you would. This guy was about as helpful as a one-story elevator. She looked at me, clicked her tongue, said, “I’ll call you back,” and disdainfully pointed over to the collection of latched hook kits that they sold. Same stuff as Jo-Ann Fabrics. Well, I wouldn’t want you to waste valuable company time to help out a customer … Pfft. Well, they DID have the rug yarn… but they only had a few batches of it, and only in standard primary colors. I did pick up a couple of batches of black, but that was all they sold that I could use. Oh it gets better. In order to make this 40″ x 36″ latched hook project work, I purchased what was advertised as a 36″ x 60″ sheet of latch hook backing from Jo-Ann Fabrics. Well, guess what. What Jo-Ann Fabrics called 36″ x 60″ was too short. It was more like 20″ x 45″ in size. Had to go BACK to Jo-Ann Fabrics and get a second one. Then I had to trim the second one down, and use the rug yarn snippets to hook and bind the two backings together as one complete cohesive sheet. I guess what I’m trying to say is … Nothing goes the way you want it to. So you have to MAKE it go the way you want it to. 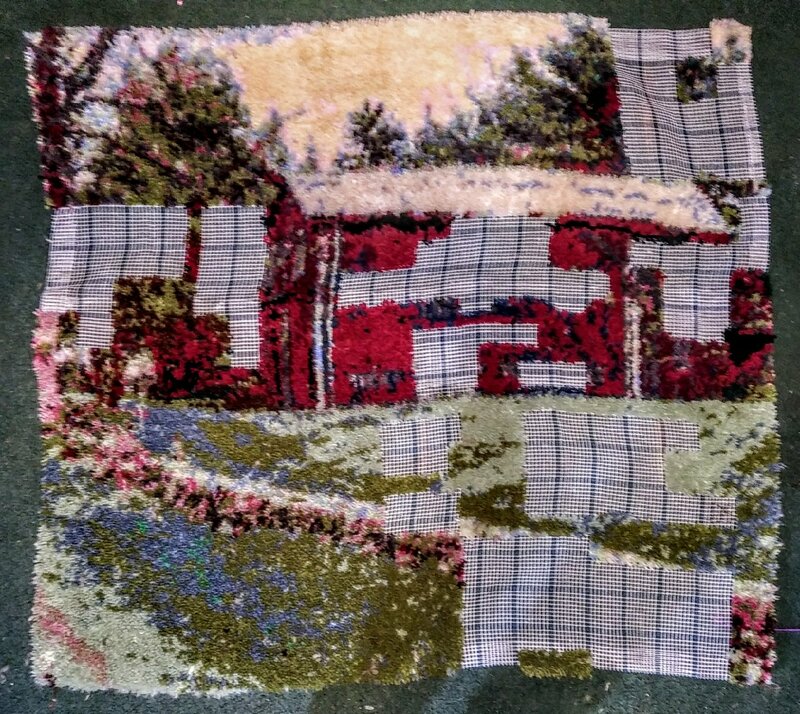 As I continued stitching into this project, I wanted to find out more about these ubiquitous barn ads. Yep … it’s research time. The program was initially suspended by the Highway Beautification Act of 1965, but a rule variance allowed barns that were previously painted to retain and repaint their heritage adverts. Unfortunately, many of these Mail Pouch Barn adverts have fallen victim to the very barns and sheds upon which they were painted. Some barns were repainted to remove the advert; others simply fell apart and were demolished. Even more barns were retouched and restored, either professionally or – in some rare cases – by the original artists who painted the barns in the first instance. Today, the sight of a Mail Pouch Barn advert on the side of an old barn is a callback to a more rustic, simple time in our history. Stop it, Miller. Just stop it. You’ve got a great photo as a base. Don’t compromise what you’re currently planning. Stay positive and stay focused. Once this is complete, you will be more than pleased with the results. See, I’m trying to make this work. I’m hoping I can get get this project into decent shape when it’s finally complete. And sometimes, I just need to motivate myself a smidge. Like my plan to merge two backings together by using this hooked rug yarn as a binder. A few strands won’t be strong enough … but whole squares of strands, all locked together, should be a nice strong bond. Yes? You tell me. One week in. The binding needs to latch together fully with Rows 9 and 10 (rows are numbered, columns are lettered), with some overlap at the top of Row 11 and the bottom of Row 8. Yeah, as you can see, this looks like the grid for a very elaborate game of Battleship. Twenty columns, eighteen rows. And as you can see, Squares 9I and 9J are complete, with several other squares in varying levels of completion. Yeah, that looks like a Mail Pouch Barn in a rural setting, doesn’t it? Sure it does. I should also let you know that each bundle of rug yarn contains 320 strands. This is what 320 strands of off-white looks like on this project. There are strands of light pink and light blue in the construct above, hopefully those strands will become more detailed as we move forward. This is two weeks into the project. Something I’ve noticed while acquiring all these rug yarn bundles. Not just the color and the texture of each strand … but also the aromas. Some of these strands are clean and odorless; others – which came from various third-party sellers – there are odors that stimulate memories of old closets and cedar hope chests and the like. As long as none of these strands smell like cigarette smoke or cat litter boxes … I’m good. While I’m waiting for more yarn to arrive, here’s where I’ve finished after three weeks of stitching. 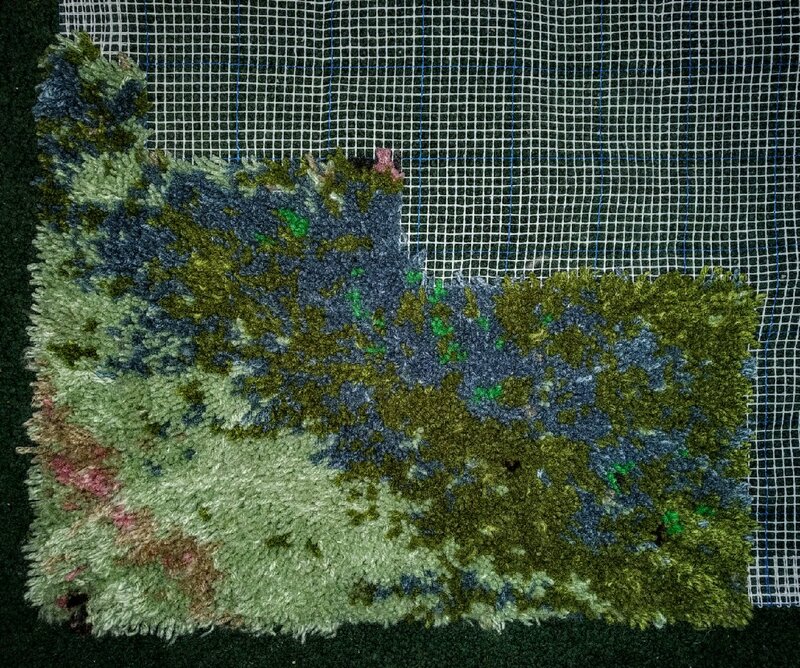 I mean, it still looks like splotches of green and red and black and off-white… but I’m waiting for more yarn to arrive, so there should be a more delineated view soon. Four weeks in. 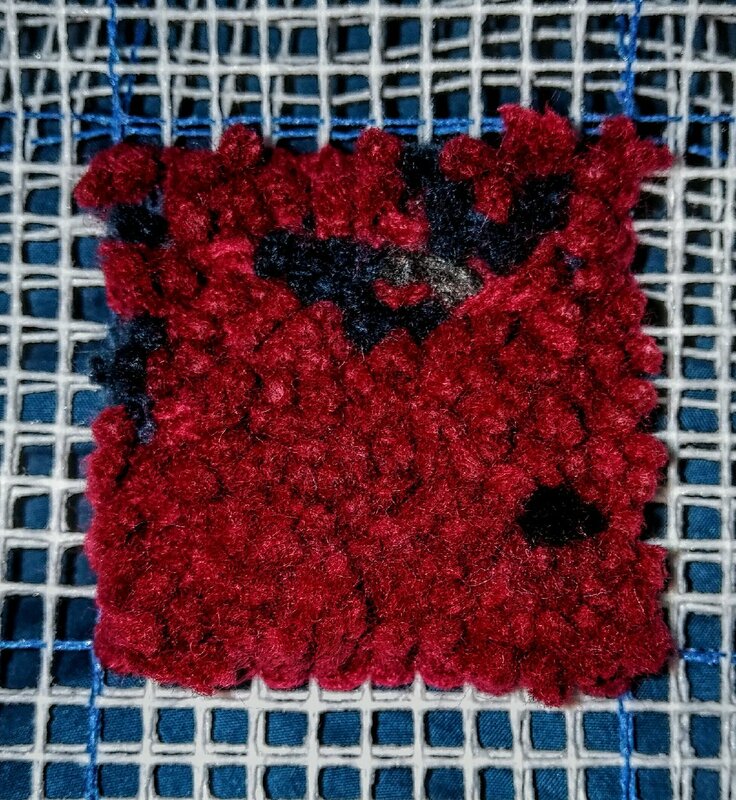 Over Columbus Day Weekend, after receiving a major shipment of rug yarn strands, I undertook completing the lower left corner of the project, as well as connecting the off-white top center to some of the red-black middle. You can actually see some gradients in the lower left corner with the light and dark greens. This is moving forward nicely. Look at that. 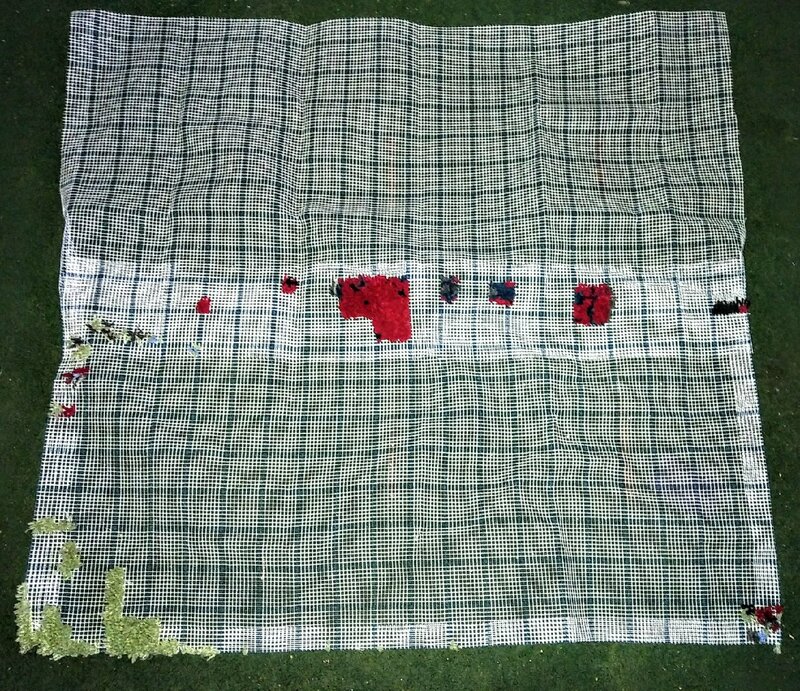 A7 through A14, B7 through B13, C9, C11, and other squares are complete, while many other squares are in varying stages of cover. The computer program that generated my print pattern for this project runs 25 pages – one page for the color keys, and 24 pages for the grids. This is what happens when those of those pages are complete. That lower left swatch represents the side of the road (the light green and brown) and the grass (the dark green and azure). Just a corner’s edge to complete 15A through 15D, 16A through 16H, 17A through 17H, and 18A through 18H. It took six different orders to get all my yarn from my dealers – even at the end, I was still short two batches of bright pink. Don’t ask me why I need bright pink for this project; the computer-generated program said I needed bright pink, and I’m not about to argue with a computer. One more order from Mary Maxim. To keep track of everything, I stored loose rug yarn in freezer bags, each bag carefully marked with the appropriate letter from my pattern. “B” for light willow, or “O” for medium avocado, for example. Hey, look, I’m six weeks into the project. 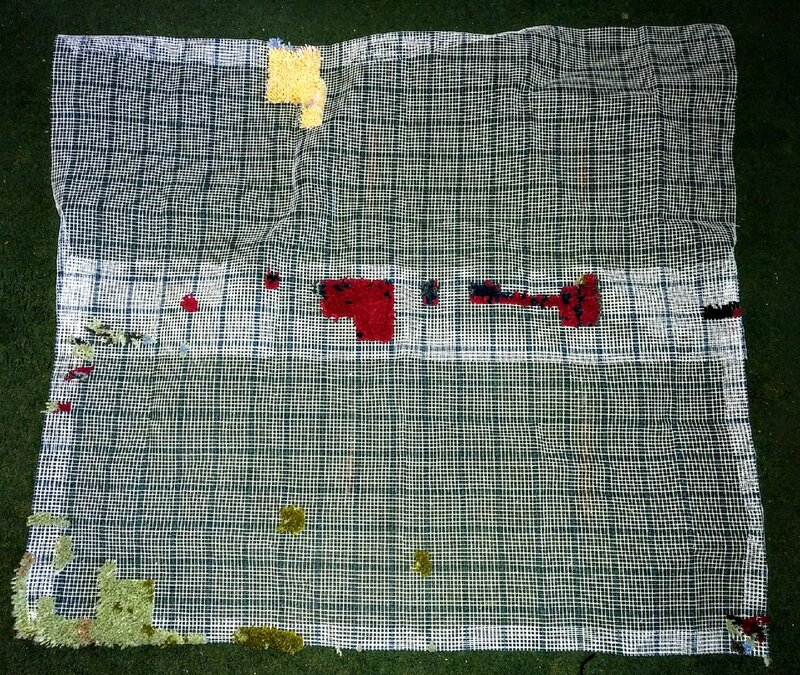 And as you can see, I’ve completed two of the four corners, and have stitched halfway up the right side and almost halfway up the left side. By late October, I had completed the four corners, and had filled in more of the lower left side of the project. In fact, you should be able to see the stone fence that cascades from 13D to 14J. Heck, you can even see where the fence should end, way over at 20P. Now if you’re wondering where the “CHEW MAIL POUCH TOBACCO” phrase is, I’m saving that for last. The big words “MAIL POUCH” should fit nicely in Row 8, the word “TOBACCO” into Row 9. The word “CHEW” splits between Rows 6 and 7. Unfortunately, there was no way for me to make the words “TREAT YOURSELF TO THE BEST” readable within the structure of this tapestry, so you’ll just have to settle for the words “CHEW MAIL POUCH TOBACCO” and be satisfied with that. Actually, if you look at the picture above, look at the big gap between the two hooked rows of red. I’m building towards that spot. As October ended, I had assembled more rug yarn strands, and we can now see trees over the horizon of the barn roof. This is cool. As you can see, there’s also a Tetris-shaped open space in the upper right hand corner – squares 2N, 2O, 3O and 4O, that should be filled in within a week’s time. By early November, I actually finished two columns – H and I – and the outline of the barn was becoming more distinct. I also had several “voids” in the project, which if I finish at least one square in void at a time, I won’t get distracted or frustrated or bored with the project. Heck, by now I’ve worked on this project for two months, and I haven’t gotten bored yet? I mean, look below. 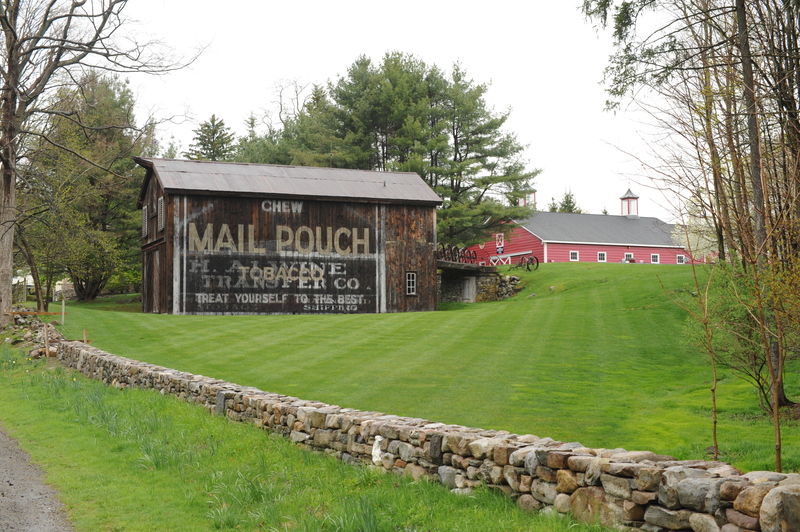 I’ve got the side of the barn, one of the vertical lines for the Mail Pouch advertisement, this is looking great. I just have to remain focused. 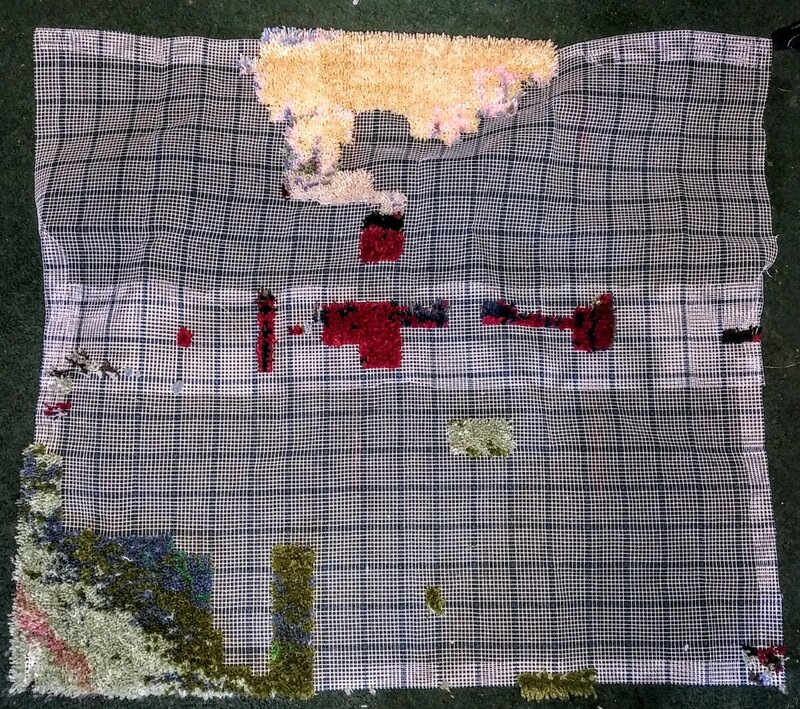 As you can see from the pictures above, the completed sections are surrounding incomplete sections, like a rug-yard-version of the video game Qix. It got to the point where I could actually clip out the incomplete section from my printout… and almost slide it into the void like a puzzle piece. Inserting that section took about two hours. It takes longer when I’m using different colored strands on every single latch. But the results are the same. A nice field of latched hook. Man, could you imagine resting your head on this and falling asleep … and waking up the next morning with strands of wool and acrylic and cotton clogging your nostrils? Yeah. By early November, I had reached the halfway point. Or passed it, to be more precise. 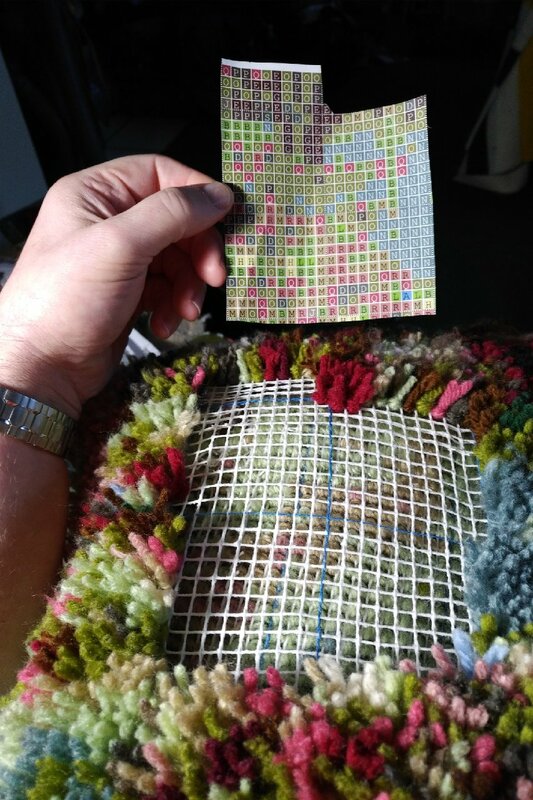 If there were 360 squares – and each square required 100 strands of yarn – this project would take 36,000 strands to finish. But after a quick count, I surmised I had at least 130 partial and incomplete squares to do. Halfway point passed, for sure. Wow. The grass field is almost done. The stone fence is almost done. The tree line is almost done. The barn is almost done. This is turning out better than I expected. But I can’t give up now. There’s still 130 squares to finish. And they’re not going to finish themselves. 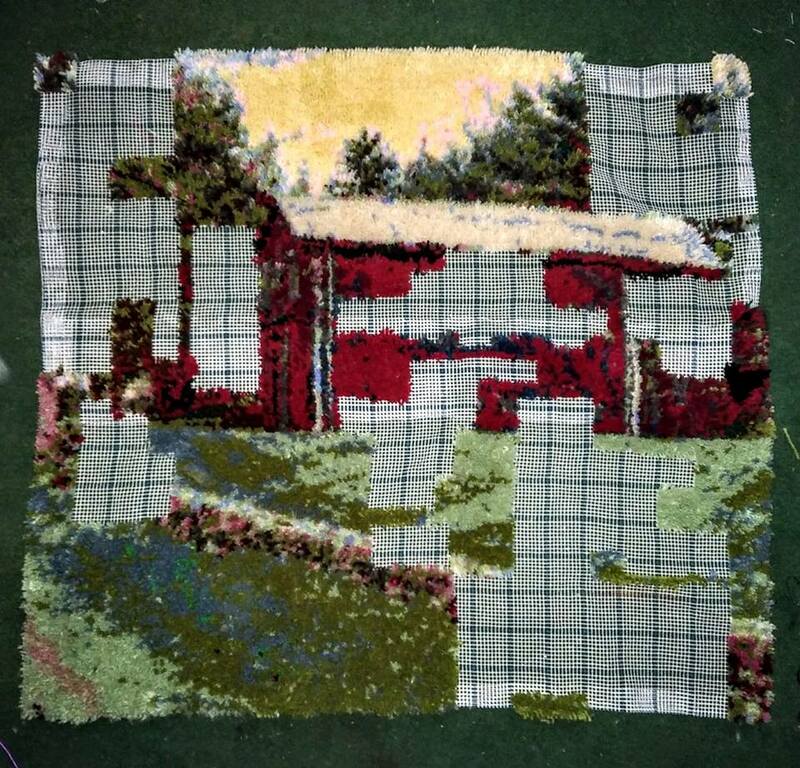 By December 26 – yes, I’ve been working on this through Christmas – I was down to only two voids, sixteen squares to finish – four in the upper right corner, and the remainder across the face of the barn. 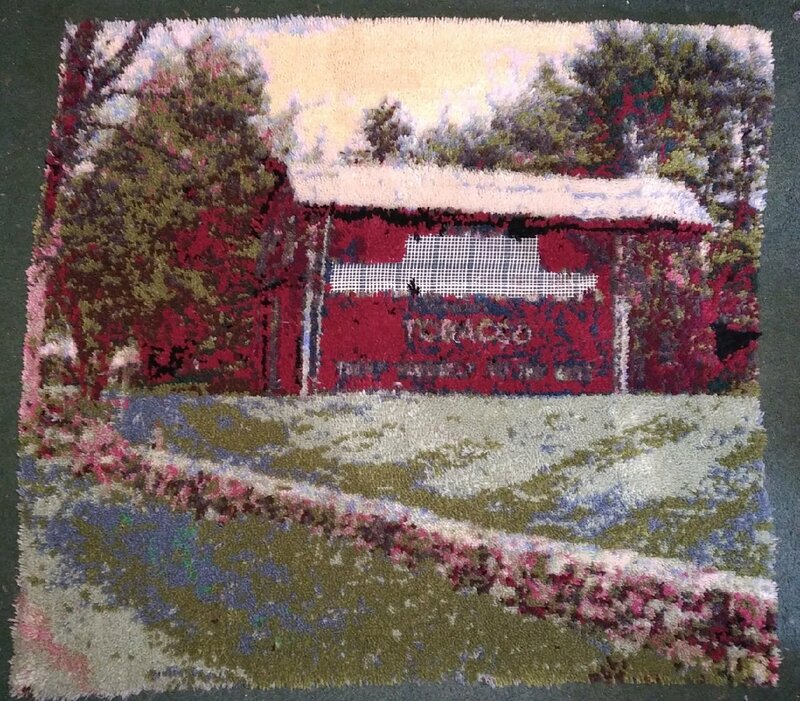 In fact, I got a little over-anxious and completed the “TOBACCO” section of the barn, just to see if it would be readable. One small mistake with this project. 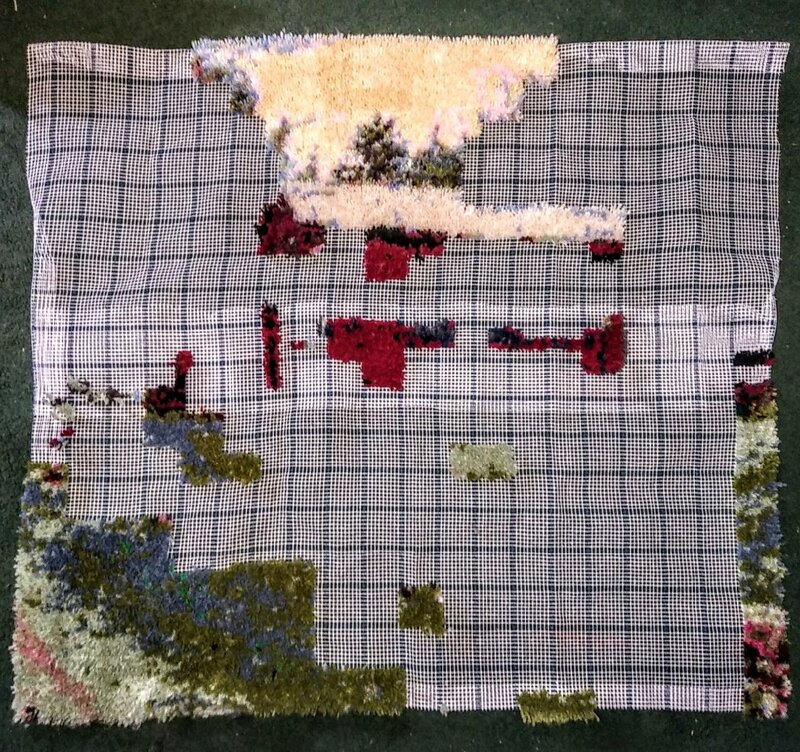 When you do latch hook rugs, you leave a perimeter unstitched, this perimeter is to be folded under the rug and “finished” with a binding fabric. No, I didn’t do that. Stupid me, I stitched all the way to the edge of the fabric. Oh well. Live and learn. By the middle of December … all I needed to complete was the barn lettering. The photo I used to generate the pattern turned out nicely. You can see the words “TOBACCO” rather clearly, even if you can’t make out the words “TREAT YOURSELF TO THE BEST.” Hey, this was my first try … I’ll take what I can get. And as you can see from the final project… it’s done. Done. Done, I tells ya. I have to find a way to tighten up the back of the artwork. 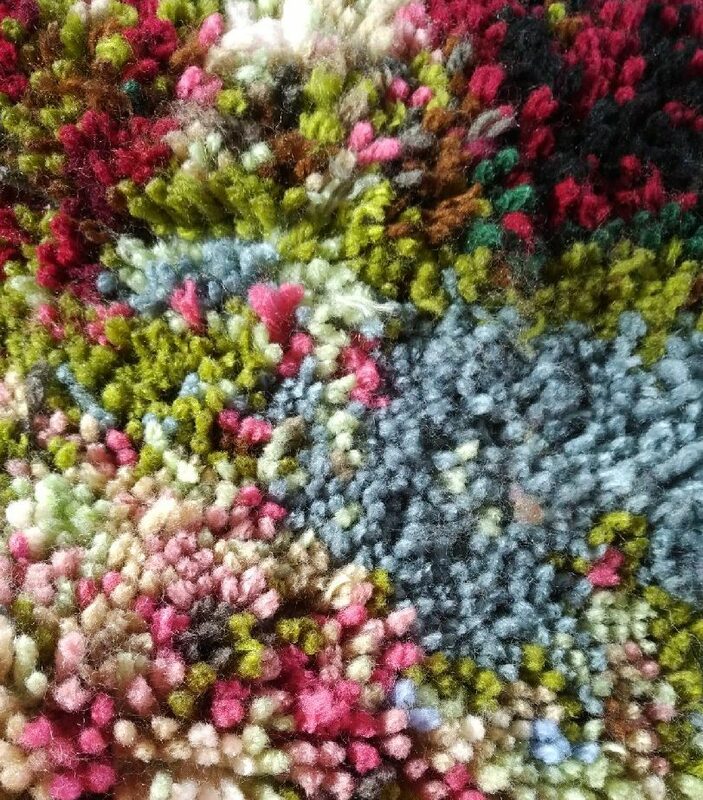 There’s some rubber compound that I can paint on the back of the rug to both keep the strands from unraveling, and also to keep the rug from slipping if someone steps on it. I should have that chemical in a few days, thanks to Amazon. Then I’ll look at my options for Competition Season 2019. I’m thinking I could enter this in the New York State Fair, they have a hooked rug category in the arts and crafts competition. I could also enter it at the Big E, they have a hooked rug category as well. 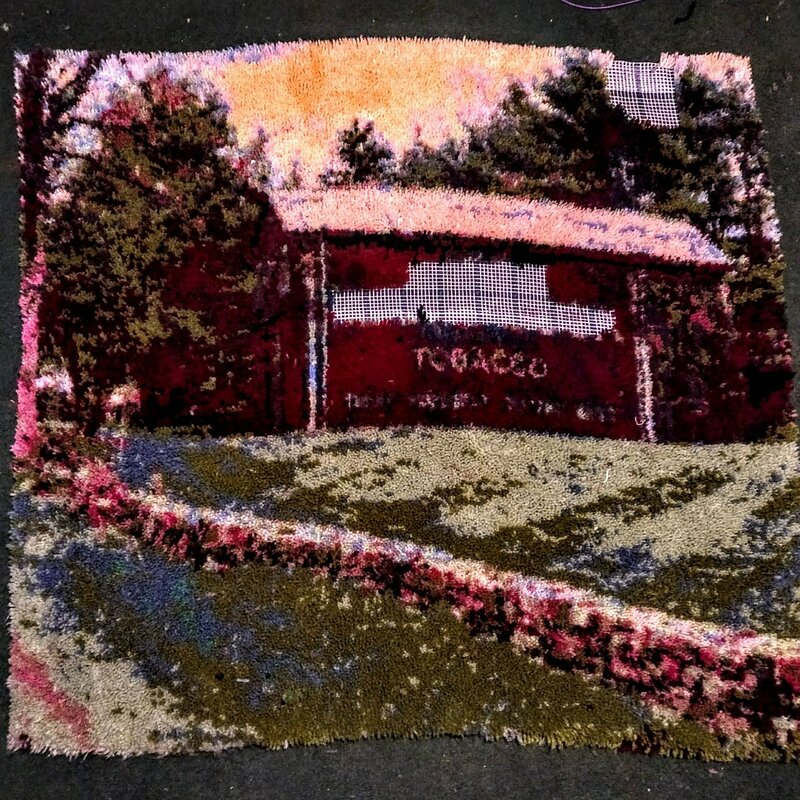 I think Altamont has one – but since the New York State Fair and the Altamont Fair run at the same time, I’ll need to craft a second hooked rug for that. Yeah, I’ve already uploaded one of my pictures to the Leftsource website. And I’ve ordered the yarn – nearly all of it – in one big block – from Herschner’s. I am impressed! No, seriously, I’m VERY impressed! Most would have started with a small prestamped latch hook kit, complete with hook, yarn, and tips. Not you! All that shopping around for yarn would have derailed me before even making the first loop. The photo you selected is perfect too. As I read the blog posting, I kept thinking, I know this would have ended up in my UFO box. (Unfinished objects) I applaud you. Make that a standing ovation!!! Well done, m’friend, well done.